Founded in 1886 and located only forty-five miles north of New York City, Tuxedo Park is a rural idyll listed on the National Register of Historic Places. It is singular among historic villages for boasting over 200 historical and architecturally significant houses nestled in more than 2,000 acres of barely tamed wilderness. Many famous and fascinating people have made their homes in Tuxedo Park: from Gilded Age names like Waldorf Astor and Augustus Juilliard, to early social trailblazers such as Emily Post and Dorothy Draper. The famed tycoons Cornelius Vanderbilt and J.P. Morgan were members of the Tuxedo Club. Pre-eminent architects of the last century, including Bruce Price, John Russell Pope, Warren & Wetmore, and the sons of Frederick Law Olmsted, an early conservationist who designed Manhattan’s Central Park and Brooklyn’s Prospect Park with Calvert Vaux, have endowed Tuxedo Park with masterpiece designs. But what makes Tuxedo Park truly unique? Why is this community so distinguished from all the surrounding towns and villages in the New York metropolis? The untold story of Tuxedo Park’s unspoiled natural environment is now given a voice in this extraordinary book. The wondrous beauty of Tuxedo Park has long been a whispered secret. But even less well known is the fact the village is a naturalist’s paradise distinguished by extraordinary biodiversity. Its beautiful acres of mountains, lakes, and forests sustain more than 450 species of flora, 150 species of butterflies and moths, and nearly 200 species of birds, mammals, reptiles, and amphibians. Its lakes and feeder streams teem with life year round. Tuxedo Park’s nature appears almost untouched by man. However, award-winning author Chiu Yin Hempel’s meticulous research reveals that, in reality, over 100 years of conservation-minded development has been responsible for the village’s continued ecological health and unspoiled beauty. Illustrated with over 200 breathtaking color photographs of the four seasons by renowned contemporary photographer Greg Miller, Tuxedo Park: The Gift of Nature opens our senses to this magical, dreamlike world. It captures Tuxedo Park’s unique character, from a sweeping view of Tuxedo Lake draped with a fine morning mist to a delicate portrait of the iridescent wings of a dragonfly. This book is a revelation of the gifts that Mother Nature has passed down to Tuxedo Park since time immemorial. Tuxedo Park: The Gift of Nature is the third volume in an illustrated trilogy about this historic community. Together, the books celebrate the three characteristics that have put Tuxedo Park in a league of its own: its wealth of historically significant architecture; its residents at the turn of the twentieth century, many of them leaders of society; and its picturesque natural landscapes. Proceeds from all three books benefit community not-for-profit organizations. 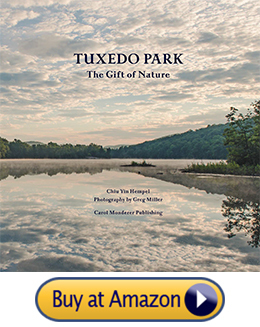 Tuxedo Park: The Gift of Nature is published by Carol Monderer Publishing. Chiu Yin Hempel, the author, also wrote Tuxedo Park: Lives, Legacies, Legends and co-edited Tuxedo Park: The Historic Houses, which was selected by HouseBeautiful as one of the magazine’s ten favorite books in 2007. Both books, illustrated with contemporary and historical photographs, won the Excellence Award from the Greater Hudson Heritage Network. Chiu Yin Hempel is a Trustee of the Preservation League of New York State.